^ 1.0 1.1 1.2 1.3 1.4 1.5 1.6 1.7 Smith, Peter. 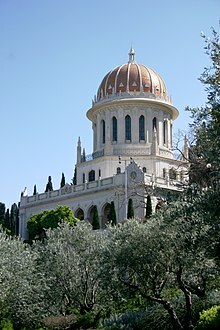 Bahá'í World Centre. A concise encyclopedia of the Bahá'í Faith. Oxford: Oneworld Publications: 71–72. 2000. ISBN 1-85168-184-1. ^ UNESCO World Heritage Centre. Three new sites inscribed on UNESCO’s World Heritage List. 2008-07-08 [2008-07-08]. ^ 8.0 8.1 8.2 Smith, Peter. Arc, buildings of. A concise encyclopedia of the Bahá'í Faith. Oxford: Oneworld Publications: 45–46. 2000. ISBN 1-85168-184-1.